Will Boeing drag the Dow down with it? When Roger was 71 years old, his wife noticed he was no longer interested in lifelong hobbies like golf and playing cards. Instead, Roger spent long stretches sitting in front of the television and, contrary to previous habits, sleeping up to 13 hours per night. His wife encouraged him to visit his primary care physician, who prescribed an antidepressant; when that didn’t help, Roger’s doctor ordered a psychiatric evaluation. To the psychiatrist examining him, Roger admitted he was less energetic and outgoing since he’d retired four years earlier but said he didn’t feel markedly sad. Roger’s take? He’d simply retired too early. As for the exam, Roger was able to repeat a complex sentence verbatim, calculate three out of five math problems correctly and recall the year… but he couldn’t remember the month or day of the week. When Roger completed the full evaluation, he was given the diagnosis one person in the U.S. is given every 65 seconds — Alzheimer’s disease. 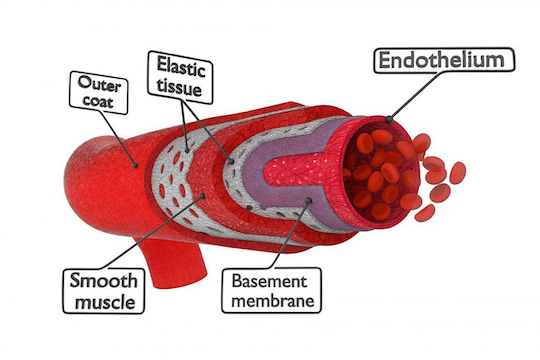 Arterial stiffening occurs when the layers of the artery walls are damaged by things like inflammation, high blood pressure and high cholesterol; as a result — over time — arteries become less elastic and less able to regulate proper blood flow. “As [arteries stiffen], their ability to cushion the pumping of blood from the heart is diminished, and that transmits increased pulsing force to the brain, which contributes to silent brain damage that increases dementia risk,” says the study’s senior author Rachel Mackey, Ph.D., assistant professor of epidemiology at the University of Pittsburgh. The 15-year study followed 356 older adults, none of whom had dementia at the study’s outset. By the end of the study, participants diagnosed with arterial stiffness were 60% more likely to develop dementia, including Alzheimer’s disease. That’s clinically significant… but there’s a silver lining. The study says: “Arterial stiffening can be reduced by antihypertensive medication and perhaps also healthy lifestyle changes such as exercise. Until now, we’ve only talked about Americans like Roger who suffer from Alzheimer’s; worldwide, the outlook’s even more depressing…. More depressing still? The medical and pharmaceutical communities don’t have an answer for this worldwide scourge. “Between 2002 and 2012, there were 413 Alzheimer’s clinical trials testing 244 different drugs,” Ray says. The outcome: Out of 10 years of research and testing, only one drug was approved by the FDA. And at best it only masks the symptoms of Alzheimer’s, buying sufferers a few precious months. Now, a doctor and researcher — a recipient of the 2018 Flagship Pioneering Leader Award — is bucking conventional wisdom about the root cause of Alzheimer’s disease. For years, neuroscientists have concentrated on the proliferation of amyloid plaques on the brains of Alzheimer’s patients. 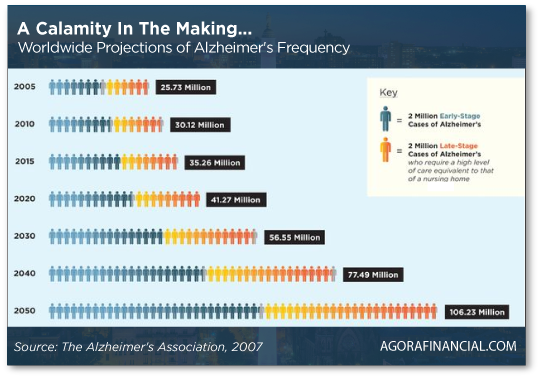 Theoretically, they thought, if you combat the buildup of amyloid proteins, you cure Alzheimer’s disease. But what if that’s not the root cause of Alzheimer’s? One doctor asked the question — and offered a dissenting opinion. According to his research, Alzheimer’s disease is more like an autoimmune disease, with a protein called TREM2 attacking healthy brain tissue. With an aging brain — along with other risk factors like arterial stiffness — the TREM2 protein can mutate and “rampant TREM2 proteins kill one healthy brain cell after another,” says Ray. “Back-to-back papers from The New England Journal of Medicine show that if TREM2 proteins are out of control in your body, your chances of developing Alzheimer’s skyrocket by 200%! “But this doctor is taking those findings a step further — creating a treatment that specifically targets the true ‘bad actor’ in Alzheimer’s disease,” Ray says. “Its laserlike focus could mean effectively treating Alzheimer’s.” A cure for Alzheimer’s? The breakthrough of the 21st century. [Ed. note: Ray’s convinced the gains from this one Alzheimer’s biotech stock will tower over his other stock recommendations. Then in September, readers who invested in a Huntington’s disease therapy at $11.22 per share closed out at $42.43 per share. Almost quadrupled in 11 months! If you need more convincing, insiders bought up 11.8 million shares of this Alzheimer’s stock in a single day… Just one more reason Ray believes shares of this company are poised to absolutely skyrocket. “Tech breakouts lit up Wall Street on Monday as the major averages shook off last week’s sluggish performance,” says Agora analyst Greg Guenthner. 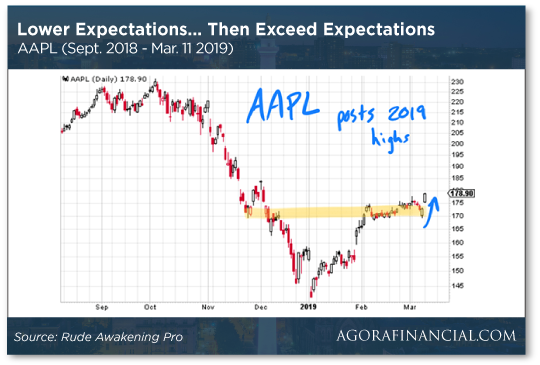 Specifically, Greg takes a look at Apple’s impressive bounce back from December’s doldrums; Apple played Wall Street’s favorite game: lower expectations… and then beat them. Apropos of juking the stats, Apple experienced “a post-earnings rally in late January after it beat estimates by just a penny.” Yep, that’s all it took to erase fears about flagging iPhone sales and Apple’s scramble to crack the code on the Chinese market. Looking at the tech-heavy Nasdaq Index today, it’s added 50 points to 7,608. The S&P 500’s also in the green, up 14 points to 2,797. The Dow’s a different story: The Big Board’s down about 70 points to 2,554… It could be worse considering the global drama surrounding Boeing. Following the plane crash in Ethiopia on Sunday, Boeing’s shares trimmed losses to 5%, or $22 per share, yesterday. The concern centers on the Boeing 737 Max 8 aircraft that’s been involved in two plane crashes in six months. Now countries across the globe are grounding the planes, most notably China, the U.K. and the EU. Will the U.S. ground the planes? So far, Southwest and American Airlines have publicly endorsed the Boeing 737 Max 8. Boeing shares continue to fall today, down another 7%; since Boeing is the blue chippiest Dow stock, it holds sway over the entire index. The number shows a modest improvement over January: The index rose just half a point to 101.7. The end of the government shutdown is a plus; on the flip side, good help is still hard to find. 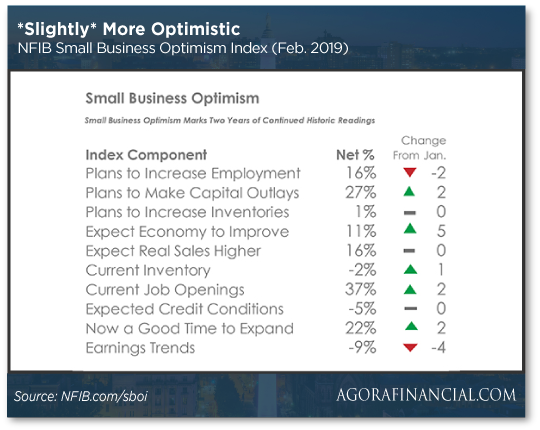 “Small business owners are thankful to have the government shutdown in the rearview mirror but need more certainty about the future,” says NFIB president and CEO Juanita D. Duggan. This despite a five-point gain in those who expect the economy to improve… hmm. Asked about their single-most important problem, “quality of labor” is far in front — again, good people are hard to find — and it’s been the top category for about a year now. The Labor Department reports today its consumer price index (CPI) increased 0.2% for the month of February — this mostly due to rising costs of food, gas and rent. Prior to February, the CPI had been flat for three months straight. We turn to ShadowStats for an unflinching look at inflation: While the Labor Department reports a 1.5% year-over-year rate (as Dave likes to say, any resemblance to your own cost of living is purely coincidental), the real-world inflation rate stands at 9.22%. That’s the rate the wonks would have calculated 40 years ago… when they were honest? At any rate (heh), there ain’t no pressure for the Fed to resume raising rates at this juncture — nothing in the numbers should change Jerome Powell’s newfound dovish religion. 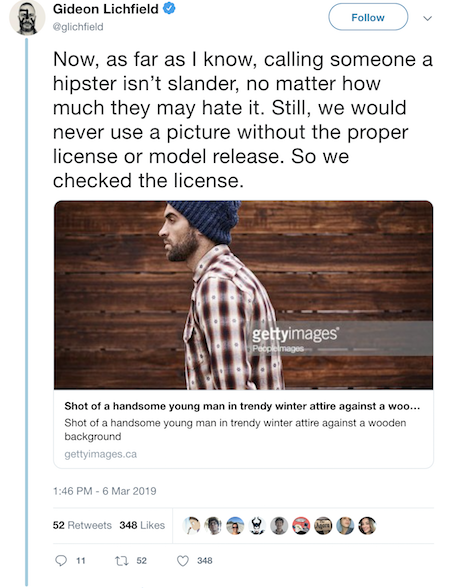 And — in a case of hipsters not always loving irony — the pic turned out to be a Getty stock image instead of a pic of his bearded, beanied likeness. Which completely proved the point of the study reviewed by the MIT technology journal: Why do “nonconformists” all end up looking alike? There you have it… the hipster effect. Oooh… he’s an angry hipster. Shares of a tiny, unknown startup on the West Coast could be about to skyrocket. Need proof? Company insiders have gobbled up 11,843,747 shares of the company’s stock… in a single day. Whatever they know, the message is clear. Something’s happening — and this one looks like it’s about to make a lot of people very rich. Get the details while you still can by clicking here.